Note: You can substitute vinegar for Purell if you prefer. It will still set the dye. Rice set with Purell dries very quickly. If you substitute vinegar, you may need to spread it out on a tray to dry overnight. The colored rice was ready for an “art project” the next day. I say “project” because this consisted of Johnny making a Big Mess while Emma carefully glued one grain of rice at a time onto her piece of paper. 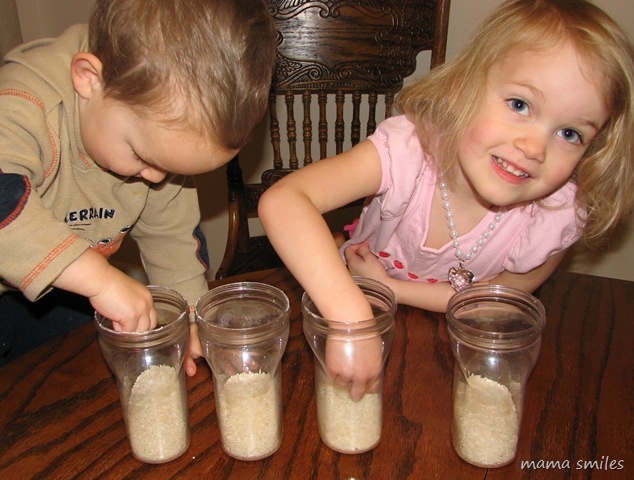 If I were to do this particular project again, I would have the kids use liquid glue bottles instead of glue sticks – the grains of rice stuck to the glue sticks too easily. 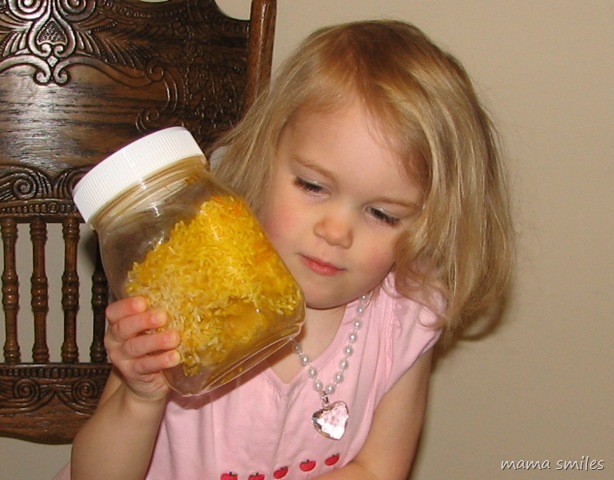 I plan to let Emma make a colored rice layer jar, and then…. 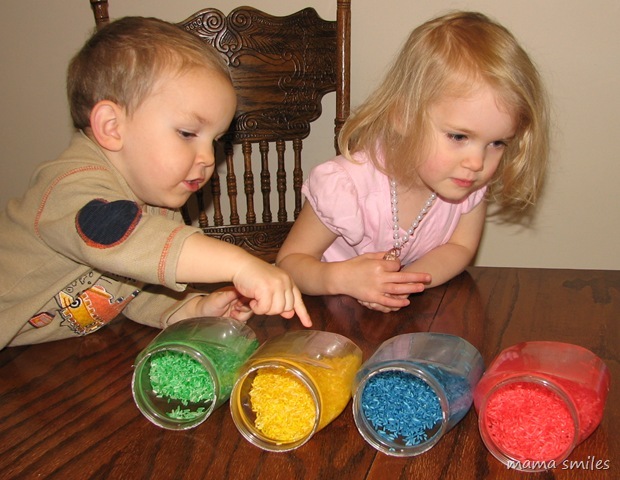 Use the mixed-together rice for sensory play. Put together that I Spy bottle I was planning to make in the first place! If you have more ideas, come share them on my Facebook page or tag me on Instagram! Join my mailing list for more fun activities for kids in your inbox each week! I LOVE this idea! Thank you for sharing it. The ideas you come up with are amazing. Funny the did not want to have the animals be trapped in the jars forever! My son likes to pour grains through funnels. But for rice you might need one with a wide passage. I love what different personalities your kids have! 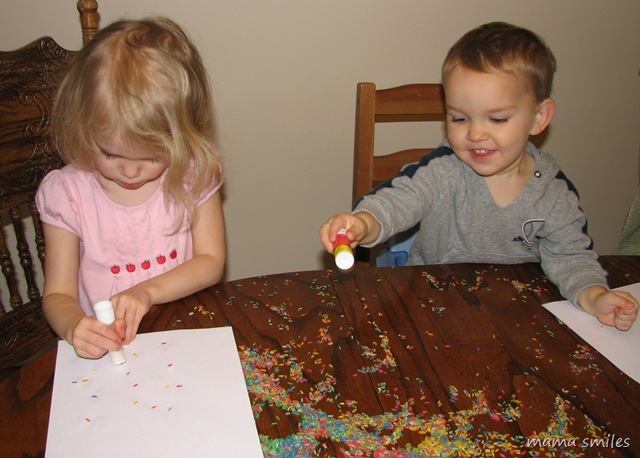 Johnny looks so reckless and wild while Emma is so careful at placing each grain of rice on her paper :) Great idea! We don’t have school at all next week due to Thanksgiving, so this would be a really fun project to try. We have made colored rice before using liquid watercolors. D loved playing with it. Too funny how Johnny and Emma took the rice project. I have no suggestions on using rice – we don’t play with food on principle. I am planning to write a post explaining why. Silly question and maybe I’m just really bad at reading today, but did you put water in with the food coloring? Or was it just food coloring and purell? Thanks for the great idea! @Chandra – just food coloring and purell, no water. I was actually surprised at how little food coloring was needed too – that stuff goes a long way! Oh my goodness, you were not kidding about the Big Mess! Too cute. Have you tried a rice tray to draw letters in? This rice is so pretty, and looks like so much fun! M likes to use glue in a bottle and make a design then shake sand on it. I’m sure the rice would work the same way… you’re right that it might be easier than using glue sticks. Also, they could stand things up in the rice jars – feathers, pipecleaners to put beads on… that’s all I’m coming up with. :) Great post! What a fun idea. Johnny really did make a mess! It turned out so pretty and colorful. I’ll have to try this eventually. Your colored rice turned out great! We’ll be trying this today for a play date we’re hosting… how fun! help them to draw a nature scene such as mountains,river,trees etc. and use the colors of rice to paste on each scene. A little water and a little flour makes a great cheap paste. Then let g and g chris see the art work when it is complete. love ya- g and g chris. help them to draw a nature scene such as mountains,river,trees etc. 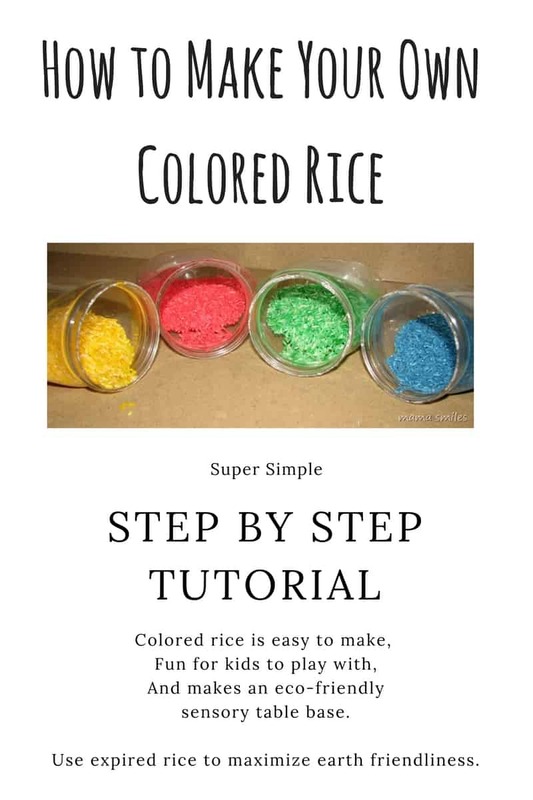 and use the colors of rice to paste on each scene. A little water and a little flour makes a great cheap paste. Then let g and g chris see the art work when it is complete. love ya- g and g chris.now if I can get this box to send the message. love how vibrant the colored rice came out.. beautiful! .-= nadia´s last blog ..Tot School and Monster Tot Pack =-. .-= sunnymama´s last blog ..Why Love Matters Giveaway =-. I don’t have any ideas for the rice, but when I was a little girl, a lonnnnnng time ago, in the ’50s (1950s, not 1850s 8-), my mom and a neighbor used to color salad macaroni and then we would string them together to make necklaces and bracelets. We didn’t have Purell back then, but I think they used a mix of food coloring, vinegar and water, like we did for colored eggs before the “invention” of egg dye kits. I’m 63 now, and I still remember those sessions fondly! Sorry, but what is Purell? Alcohol-based hand sanitizer. Regular rubbing alcohol works as well, as does white vinegar (although, white vinegar takes a bit longer to dry).